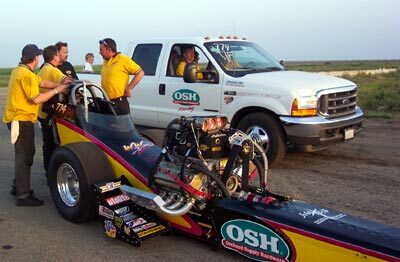 Jim Murphy and the OSH-WW2 Racing team started the 2003 season the same way they ended the 2002 campaign - with a huge win. 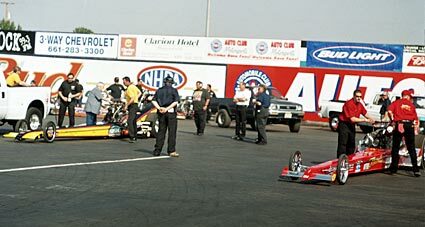 The March Meet has been held at the Famoso Raceway outside Bakersfield, CA for the last 44 years. 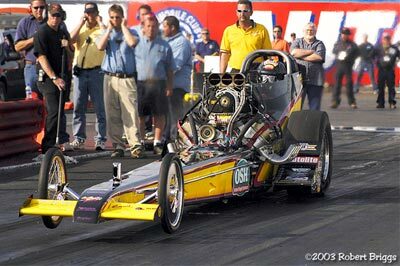 Next to the US Nationals, it is the longest running annual event in drag racing. 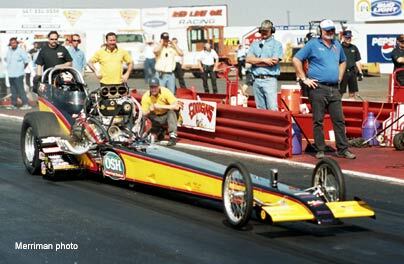 In four decades only one driver has won Top Fuel Eliminator three times ... until this year. 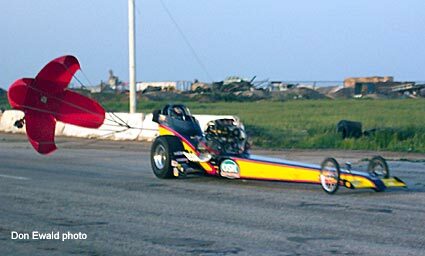 When the sun set Sunday evening, Jim Murphy and the OSH -WW2 Racing crew were the victors over a revamped race track and a stellar field of Nostalgia Top Fuel Dragsters. 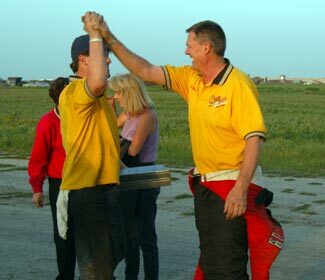 The final pitted the two quickest cars on the property, the yellow and black entry of Murphy and the new VRA ET record holder, Roger "Radar" Lechtenberg in the "Orange Crate" of Dale and Kat Suhr. 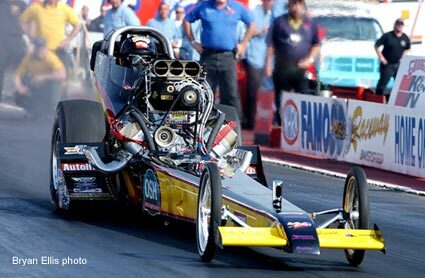 Jim's 5.97 was more than enough to cover the trouble plagued Radar and give the team their first step in regaining the VRA Top Fuel Championship and putting the big # 1 back on the car. 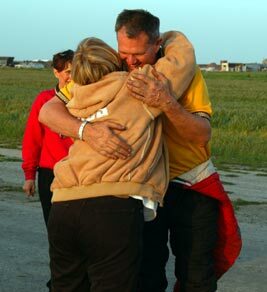 Enjoy the entire story and photos below. 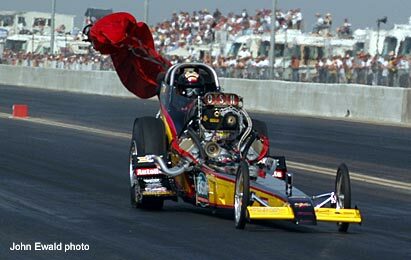 The Top Fuel final was literally anybody's race. 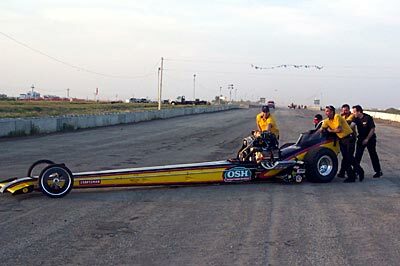 Roger "Radar" Lechtenberg had a 5.91, 5.85 and record setting 5.78 under his belt, while Jim Murphy had carded a 5.80 (256) and 5.98 in eliminations. 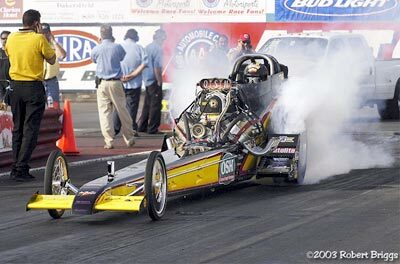 Lechtenberg had a slight starting line advantage and was barely leading to the 600' mark when his engine started eating its internal organs. 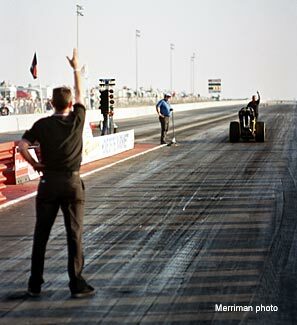 As the sun sets over the track, Murphy hits the throttle in route to a 5.97 win and a third March Meet trophy. 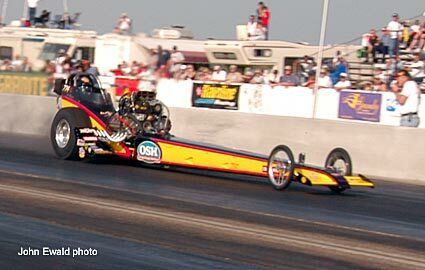 By 800' it was a done deal and Murphy streaked on to a 5.97 @ 240.25 win. 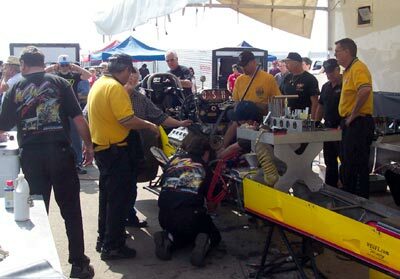 Covered in oil, Lechtenberg had a hand full of race car and finally got it stopped in Murphy's lane. Like the Rolling Stones song, "It's All Over Now". 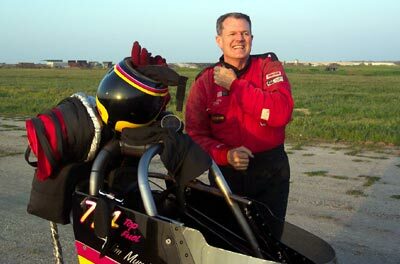 The chute is out, the car stops and out pops a very happy Jim Murphy. 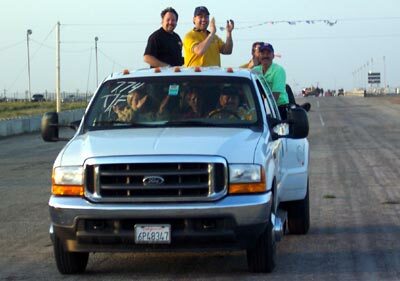 Murphy gets comfortable while his elated crew comes to get him (below). 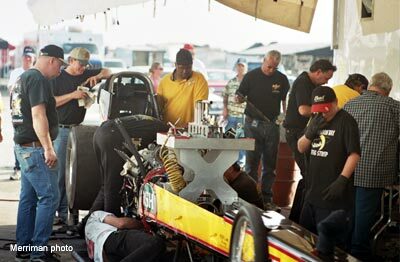 In the background you can see the VRA Safety Safari tending to Roger Lechtenberg who had more than his share of problems during the race. 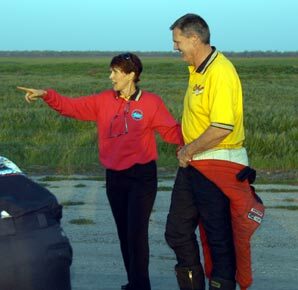 The crew gets the car ready for the Winners Circle photos while Jim shares the thrill of victory with wife, Judy. 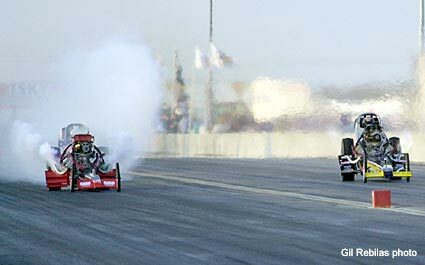 Backing up to Sunday morning, without question, the best race of the day was the first round match up between Jim Murphy and Jack Harris. Both cars had struggled in qualifying - neither getting in until the last session. 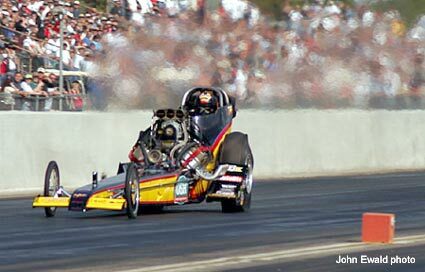 Jack's 5.96 was good for the # 3 spot while Jim's 6.18 was only good for the #11 position. 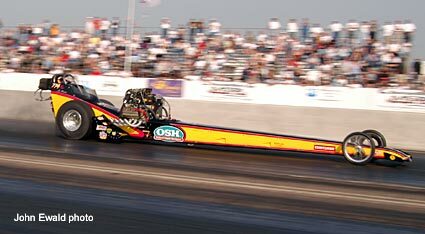 So on paper, Harris looked to be the favorite, but races are never run on paper. 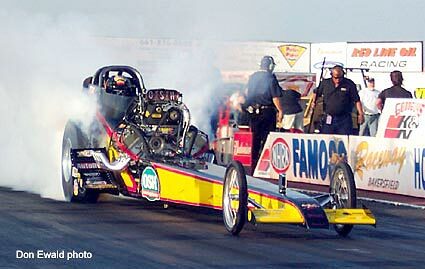 Murphy heats the tires prior to his round one race with Harris. 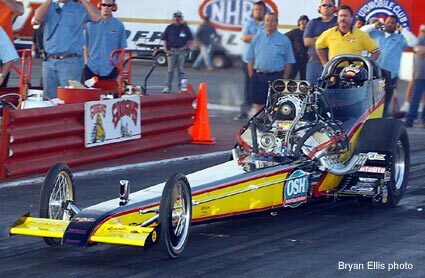 Jim got a huge hole shot (0.515 to a 0.621) and never looked back in the quickest side by side race in NTF history - 5.80 to a 5.93. 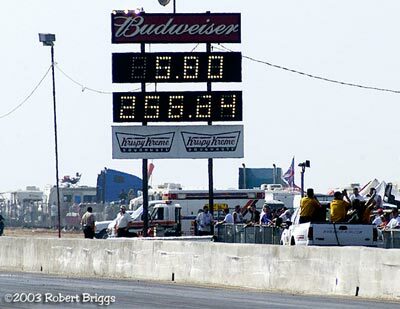 For good measure, the OSH-WW2 Racing fueler tripped the clocks with an incredible 256.84 top speed ... the fastest MPH ever for a front engine dragster. Murphy launched like a rocket and never missed a lick in route to his 5.80 win. 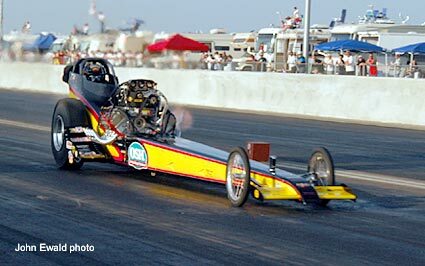 256 MPH - stable as a rock. 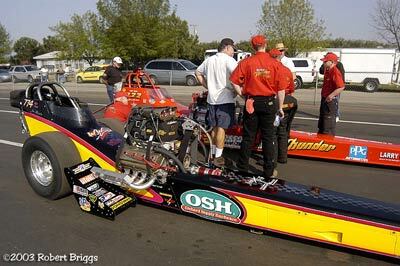 Going into the second round against the always tough Rick McGee, the OSH team was just trying to repeat their first round numbers. 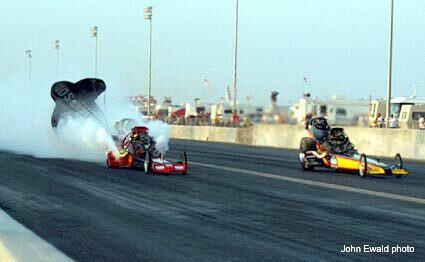 The cars left together and most figured Murphy would pull away down track. 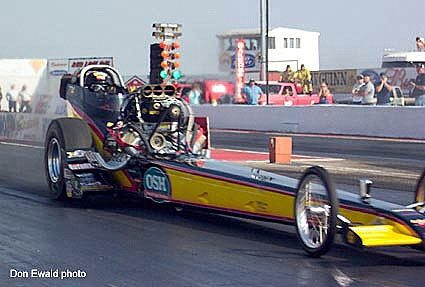 Murphy's car had basically the same tune up as the previous run and left the starting line perfectly. 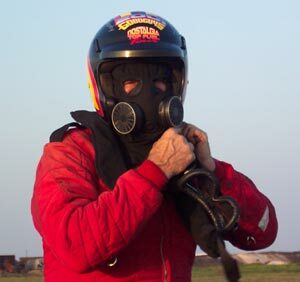 However, the track surface had gotten hotter and after a close race to half track the abundant horsepower in Murphy's fueler started the rear tires to spin, causing the engine RPM to go dangerously high. 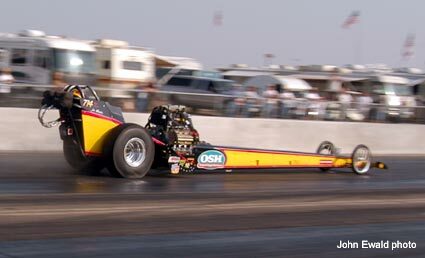 When pulling on the break didn't stop the spin, Murphy was forced to shut off and watch McGee take a 6.07 @ 224. 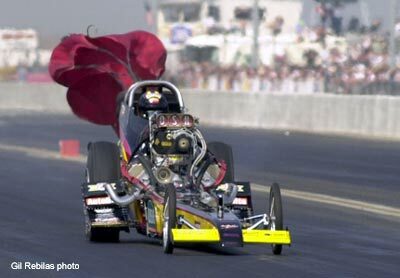 Even with the early chute, Jim still ran a 6.10 and only 195. 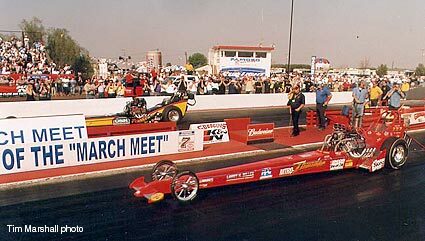 Had the car not spun the tires, the times would have been close to those in round one and the win would have been in the bag. 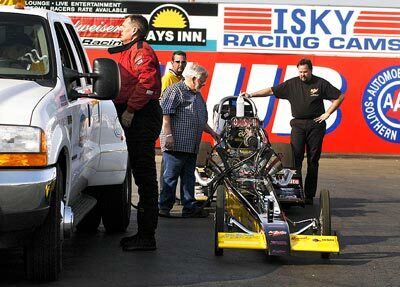 After the second round loss to Rick McGee, Jim Murphy capitalized on the one thing all racers need, a little luck, to proceed to the finals. 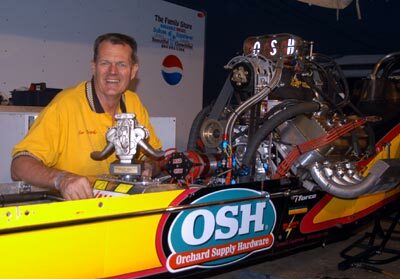 When the Dunlap & Fuller car was unable to repair their round two damage, Murphy (being the quickest loser from the previous round) got back in on the "break rule" (designed to put on a better show for the fans), and went on to beat the newest member of the 5-Second Club, Howard Haight in the semis which put the Orchard Hardware Supply fueler into the finals. 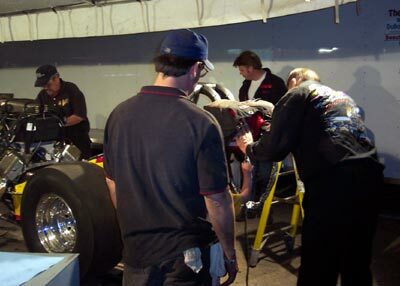 Tim Beebe makes last minute adjustments the engine as Jim Murphy puts on his firesuit prior to their semi final race with Howard Haight. A strange thing happened to Murphy during his semi final match up with Howard Haight. 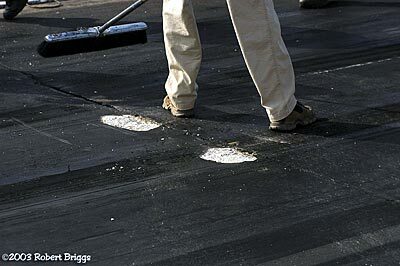 After his burnout the starting line crew found two chunks of track missing near the staging beams. After some momentary confusion, Murphy was moved over to the left about a foot. 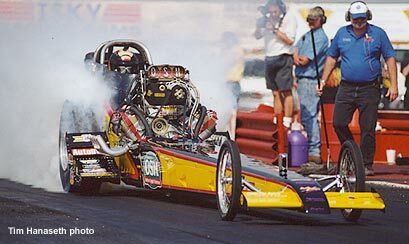 He then proceeded to rip off a 5.98 @ 241 in his new groove which easily defeated an up in smoke Haight. 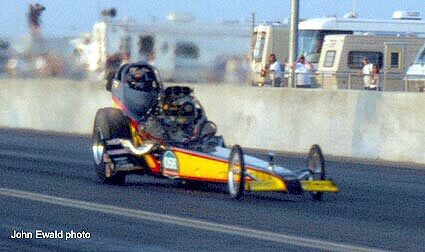 Look to the right of the front wheels and you can see the damaged surface. Two huge chunks of track are gone down the foundation. No clue what caused it. Nonetheless, Murphy got the win and was into the finals. 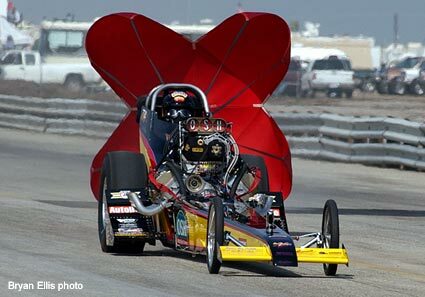 The following shots were taken over the weekend and show what goes on off the track. Jim Murphy proudly displays the award he received Wednesday evening before the March Meet from The Motor Sports Press Association. 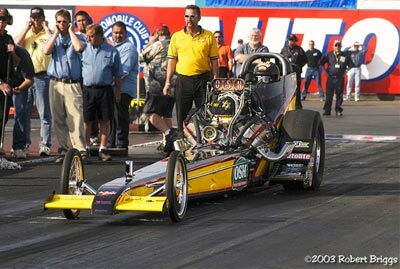 The prestigious group chose Murphy "Drag Racer of the Year" for his participation in the Goodguys (VRA) nostalgia series. 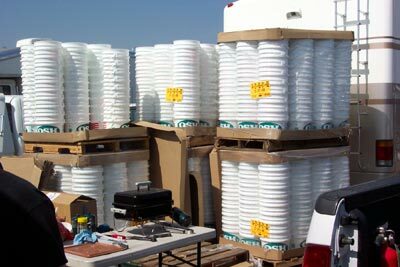 The hottest ticket at the March Meet were the hundreds of OSH 4-gallon utility buckets given away at the WW2 Racing trailer to the fans. 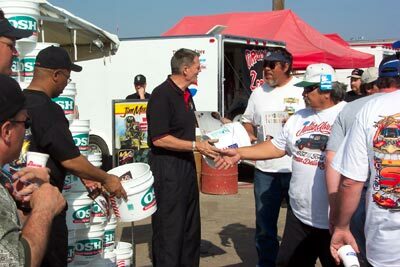 Crew member Jon Moore had the enviable task of passing out the buckets, thus meeting all the great fans that follow the Orchard Hardware Supply dragster. 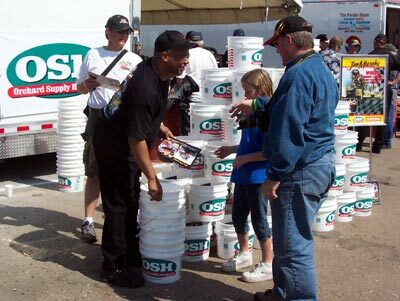 Jim Murphy spent all the time he could shaking hands and autographing the OSH buckets and full color handouts. 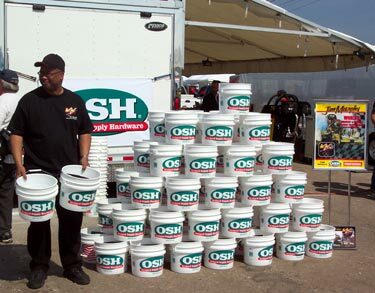 Needless to say, the attractive OSH buckets were seen everywhere over the weekend. 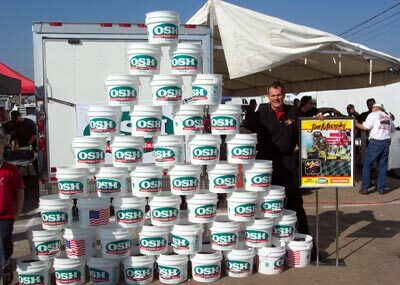 To say this was a successful promotion would surely be an understatement. 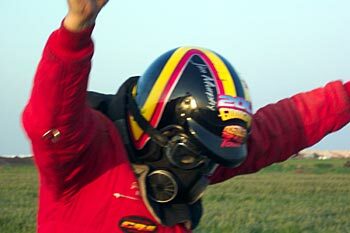 In all forms of racing the driver usually gets all the accolades when he or she does good. 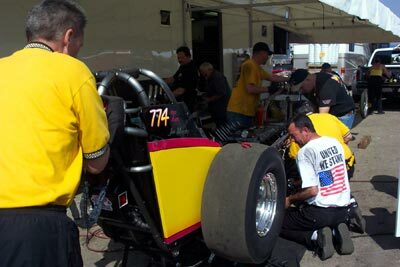 But its what goes on "in the trenches" that makes the driver look good (and often bad). 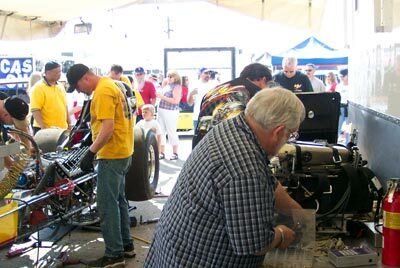 Here are several pit shots taken over the weekend of Ron Rapadas, Barry Byrne, David Thornhill, Gary Grisel, Jeff Shamrock, Brian Shamrock, Jon Moore, Tim Beebe and Jim Murphy at work in the pits. 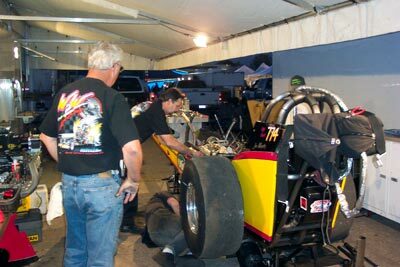 This is where it all happens because if the car isn't right when it leaves here - it doesn't perform out there. 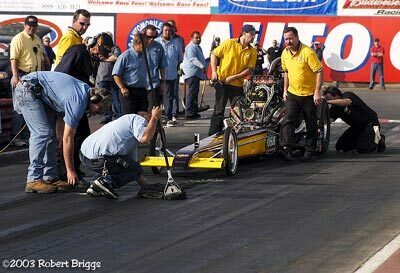 Drag racing is far from a 9 to 5 job. 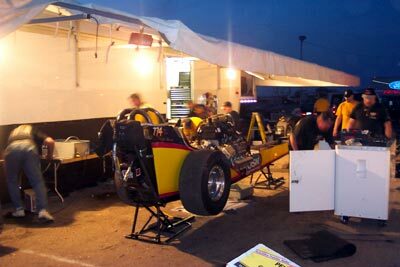 Many teams, including the OSH-WW2 Racing crew often work long into the night to get the race car ready to go down the quarter mile the next day. 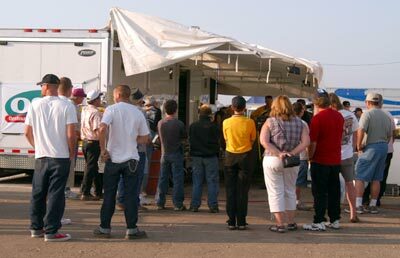 These are a rare breed of people who will eat cold hamburgers in lieu of a steak dinner in order to see their car perform as they hope on race day. 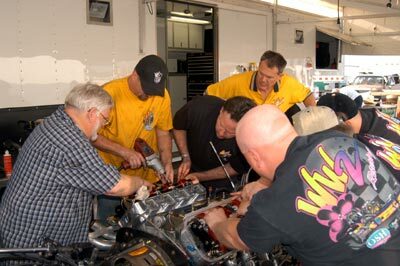 Unlike the night maintenance, the days are more hectic. There are more people willing to help and a lot more fans wanting to watch. 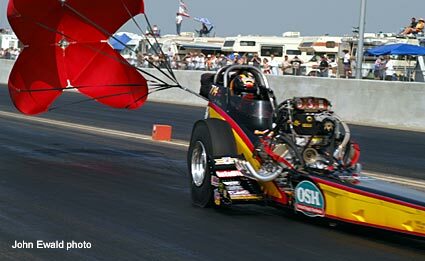 Just take a look at the next group of photos and ask yourself if this is how you'd like to spend Sunday afternoon. 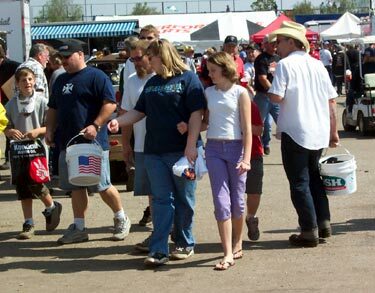 The fans at nostalgia races are no different than those at the "Big Show". They watch the between round thrashes and move from camp to camp during warm ups. 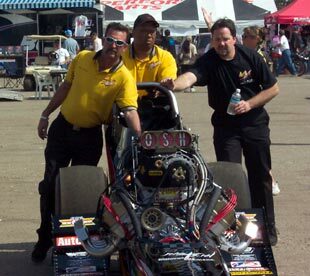 WW2 Crew Chief, Tim Beebe and Gary Grisel prepare to fire the OSH car. 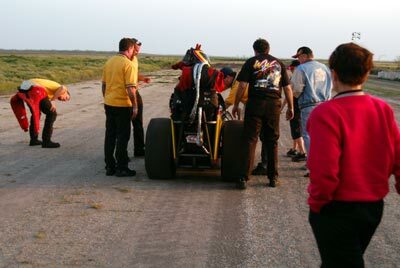 Barry Byrne (in front of the car) and Gary Grisel (behind) back up Murphy to the starting line, making sure he stays in "the groove" (the track surface with the best traction). 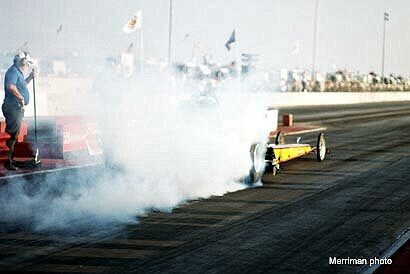 Backing up in the same tracks you made on the burnout is crucial to the best start possible. 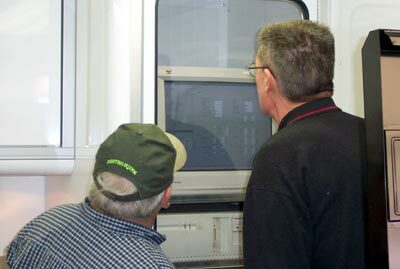 After every run the onboard data computer is downloaded and analyzed by Tim Beebe and Jim Murphy. 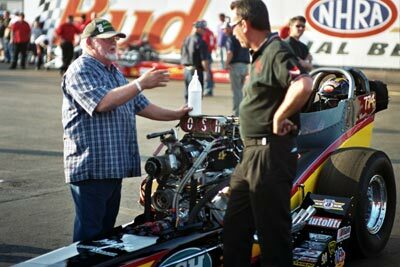 This information will tell the duo what was right or wrong on the tune up - what the engine did and where - and hopefully give them what they need to make the car run better next time. 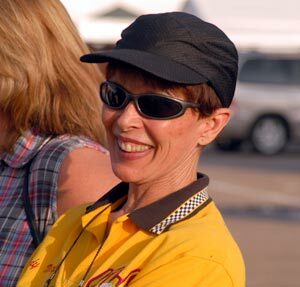 Judy "Team Manager" Murphy obviously approves of things at this time and place. 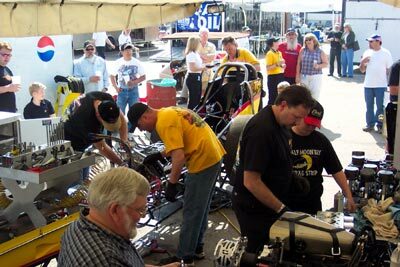 Gary Grisel, Jon Moore and David Thornhill get the car ready to be towed to the staging lanes for the final round of racing. 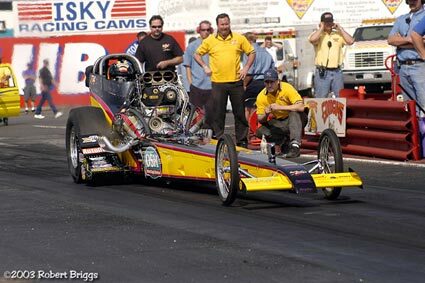 After their huge win over Lechtenberg, the WW2 team had some fun on the top end before towing the car back for the trophy, photos and the all important $10,000 purse. All is well that ends well. 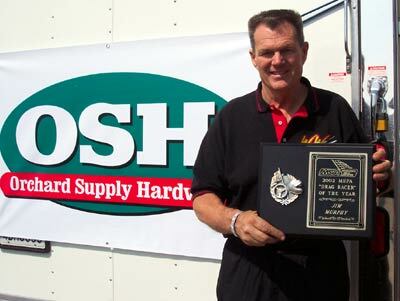 Jim Murphy and the Top Fuel Eliminator trophy for the 44th annual March Meet.